Should You Replace A Sump Pump That’s Working Perfectly Fine ? Your basement or crawl space sump pump is designed to remove water that builds up around your basement or foundation. Your sump pump activates when it’s float rises activating a built-in micro-switch. Over time and thousands of on-off cycles this micro-switch wears out rendering the pump useless. Unexpected basement flooding is often what follows. We recommend that you replace your sump pump every 5 to 6 years even if it appears to be working perfectly because you never know when it’s micro-switch is going to fail ! Although this seems like an unnecessary expense, it is small when compared with the damage caused by a flooded basement or crawl space. Another thing you should consider is a back-up system in the event of a power failure. This can be a battery type back-up pump or a longer running hydraulic back-up system that relies on ” city ” water pressure to run a separate pump as long as necessary. Visit us at www.inspectnj.com for more information. Repairing Defects & Safety Issues After You Close On Your Home. Where to Begin ? After you receive your home inspection report and the sellers respond with a list of what items will be fixed before your closing date you’ll probably be left with a number of upgrades and repairs that you will want to make on your new home. First, prioritize your list , placing any items that pose a possible danger to you and your family at the top of your list followed by mere upgrades or cosmetic issues. Make sure that any contractor you call for an estimate has a N.J. Home Improvement License – check it with the department of consumer affairs. Contact the Better Business Bureau to see if there are any complaints. First impressions in any business are important, How a contractor presents himself and maintains his truck are often good indicators of how he’ll take care of you and your job ! Beware of low bids ! A bid far lower then the others indicates that the contractor isn’t experienced enough to know the actual cost of the job or that he may never intend to finish the job. That’s a nightmare ! Plan to put only 20% up front. In general, don’t choose a contractor who asks for more then 20% up front. While some projects like custom made kitchen cabinets require a larger initial payment to cover the contractor in case you pull out of the deal, it doesn’t apply to commodity items such as roofing & lumber which a legitimate contractor will usually purchase on his account with at least 30 days to pay. Finally, BEWARE OF CASH ONLY JOBS ! This raises a big red flag. Not only does paying in cash limit your financial recourse if problems arise, the contractor is likely not operating a legitimate business which includes paying for liability and workman’s compensation insurance. Look elsewhere for a professional to perform your work. One more item, New Jersey Licensed Home Inspectors are not allowed to promote , recommend or advise their clients on selecting contractors. It’s a clear conflict of interest, once we’ve provided you with a list of defects ! Many buyers see a gas fired furnace or boiler in the basement of home that they are interested in and their assumption is that the house has always had natural gas as an energy source. Not necessarily in older homes ! Many housing developments were constructed before the availability of natural gas in the area and heating oil supplied from underground storage tanks was their first choice. The average life expectancy of a steel underground tank is approximately 25 years depending on the surrounding soil conditions. Leaking tanks and their clean-up costs can run into the tens of thousands of dollars and home owners are responsible for those costs ! Home inspectors are trained to look for signs of prior underground tanks such as, old steel filler pipes and vent pipes in the lawn or cut-off copper tubing entering the basement foundation wall below grade. The absence of these indicators doesn’t mean that you’re worries are over as sometimes basements have been transformed into finished rooms obscuring our views of the concrete block foundation. If the sellers have had an underground oil tank properly cleaned & filled or if they have had one removed you can ask for a letter of no further action from the local municipality . If no information is available your home inspector should recommend that a qualified contractor perform a metal sweep of the property surrounding the home to insure that no leaking oil storage tanks lurk beneath the surface ! Concrete slab inspections are an important part of the home inspection service. Some houses are built on a monolithic slab with no expansion joints. Some houses Have adjacent patios,driveways and sidewalks. Concrete can become cracked,heaved, settled or deteriorated for various reasons. If the concrete is poured in adverse weather conditions, shrinkage cracks may occur. Heaving or settling can be a more serious issue. Heaved walks due to tree roots can create an uneven surface and possible trip hazard(safety issue). Settled patios or sidewalks next to homes can create a negative grade and areas of water ponding. Ponding water may enter bsmts/crawl spaces. In more severe cases foundation damage may occur. I inspected a condo here in NJ last month and found the newer pergo floor heaved not too far from the exterior patio which was also settled/heaved. Most concrete damage can be repaired by minor repointing with a masonry mix. In more severe cases the services of a qualified masonry contractor would be needed for repair/replacement. On a recent home inspection in Barnegate I observered step cracking along the left side wall of the home. The cracks had been sealed at least 2x before and have appeared to re open. The cause for chronic settling like this one I believed was the rear of the home had an 8 foot grade slope that created a walk out basement in the rear. However, the change in grade appears to have pulled the brick back and the pressure caused a tear perpendicular to the stress point. As home inspectors in NJ we are required to address such issues and call for repairs by qualified contractors. Should I Have a Pre-Sale Home Inspection ? My short answer is yes, if you don’t want to be surprised by what your buyer’s home inspection report will reveal and on what you might have to negotiate a lower price on the sale of your home. Most home owners believe that their homes are in relatively good condition and they are absolutely shocked by what is revealed by a thorough home inspection. When you live in a house for a long period of time and issues arise gradually we tend to overlook or minimize them. I assure you potential buyers will not overlook anything ! During our Pre-Sale Inspections we home inspectors look for plumbing issues such as leaky faucets & dripping drain pipes beneath sinks as well as the bigger issues such as old rusty galvanized drain pipes that could scare a novice buyer. On the electrical side of things we’ll sometimes identify aluminum wiring issues to an unaware owner. Your potential buyer’s do not like to see missing GFCI safety outlets at bathroom, kitchen & exterior locations – We will make you aware of any shortcomings ! 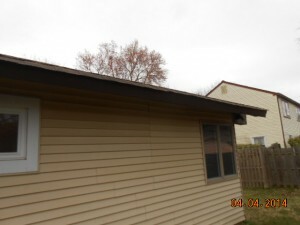 We will evaluate your roof’s overall condition and more importantly, look closely for any torn shingles, loose flashing or cracked rubber boot covers over waste vent pipes that are potential points of leakage. This will allow you to make minor repairs and diffuse a potential buyer’s request for exorbitant $$$ at closing for roof repairs ! HVAC systems will be inspected. Any receipts that you have for annual maintenance on these systems should be displayed prominently so that potential buyers recognize that you are the type of owner who takes care of their prize possession, this house. Grading & drainage around the entire perimeter of the house will be closely evaluated as a part of a pre-sale home inspection because they are often overlooked and they are primary contributors to significant basement problems such as damaged foundations and mold. With the information derived from a $ 385 Pre-Sale Home Inspection from Eastern Home Inspections you can often expect to save several thousand dollars in negotiations with your home’s buyer and their attorney. You have the leverage – not the buyer ! There are two main concerns when buying a home and having a home inspection. Don’t get me wrong there are many things that can and do go wrong but the two that seem to keep showing up are water problems and termites. A “Flip” is a house that has been purchases by an investor, renovated and then immediately put up for sale by the investor (at a profit ,of course). If you are considering purchasing a flipped house it is very important to have a home inspection by a New Jersey licensed home inspector. A “flipped” house will be pleasing to look at- fresh paint, new carpet, renovated bathroom- kitchen etc.. Possibly it will also have a new roof ,new heating system etc. It is the things that you don’t often think about that may have been overlooked. I recently did a home inspection in Burlington County on a flipped home and found a significant leak in the sewer pipe in the crawl space. It had been leaking for a while and may also have compromised the foundation wall. On the same house I also noted active knob and tube wiring running up from the basement behind the walls. It is difficult to obtain homeowners insurance when there is active knob and tube wiring in a home. Recently on a home inspection in Middletown I discovered mineral deposits (effloresence) on the rear block wall in the garage. It was on no other sections. I thought this strange. I went inside and found a burst pipe in the laundry room. The water had since been shut off and the area cleaned up. I pulled back carpets on the slab to determine if there were signs of mold. There were none. Who ever cleaned it up did a good job. I thought the carpets should still be replaced though. They were 10 years old and stained. admin on Does an older water heater need to be replaced after your home inspector identifies it as a concern ?